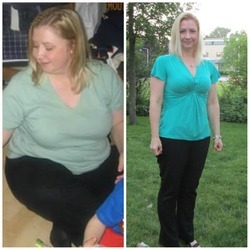 Jenny found Calorie Count when she decided to stop dieting and start living better. When she started logging her food, Jenny was shocked by how many calories she was actually consuming. By making smarter choices, and being kinder to herself, she was able to reach her weight loss goal. Now, at 60 lbs. lost, and 4 months maintaining her weight, she is more confident and living a healthier and happier life. I arrived at work one morning and walked a short distance from the parking lot to the front door. My hips began to ache and I was out of breath when I walked up the short flight of stairs to the office. That day it hit me. I avoided being in pictures and I didn’t like how I looked. I decided that was it – I was going to do it this time. I was going to get in shape. I feel like I’ve tried many other programs and nothing stuck for me! Among others, I’ve tried Weight Watchers, Nutrisystem, Atkins, and Jenny Craig. I would lose weight with each of these at first but then inevitably, the weight would creep back on. The first thing I did, and the most important, was to change my attitude. I realized this is a lifestyle change, NOT a diet. I decided that this was how I would eat and live the rest of my life. Even though I didn’t think I was eating too much, I knew that based on my weight, I was eating a lot more than what was healthy for me. When I started tracking my food intake on Calorie Count, I was shocked at how many calories I was really consuming. I adjusted my diet based on the recommendations on CC and paid close attention to the nutritional values as well. I learned about the foods I should and should not be eating to stay within my calorie range and get the highest nutritional values. I realized the types of food you eat are as important as the total number of calories. I set goals of 10 lbs at a time and just focused on reaching those smaller goals instead of it all at once. I joined the local health club and committed to making exercise a regular part of my life. I workout about 4 times a week and have steadily for the past year. I started with just walking on the treadmill and gradually increased my workouts. The workouts not only help me keep the weight off, they make me feel great as well. I tracked my weight loss progress as well as my BMI. The small successes encouraged me to keep going. Calorie Count was the ONLY program I’ve used that actually got me to my goal weight! Logging your food intake is so easy there is really no excuse not to track your meals. And, the online community here is so encouraging. We are all in the same boat so to speak! The activity and weight logs are also very easy to use. The reports you get back give you a ton of information on where you are at and how you are doing. I have tried losing weight for most of my adult life and was never able to reach my weight loss goal, let alone keep it off. I would always start this program or that program and lose weight at first, but then I would have a bad day and go off my diet. I’d get so discouraged and be so hard on myself that one bad day turned into two bad days and so on until I would completely gain everything back that I lost. My past is a long list of failed attempts over the years but I never gave up. I would always try again. I could see results on the scale in the first week, but I didn’t notice a visible change until about two months in. My clothes started getting looser and my hips didn’t hurt me when I walked short distances anymore! I think when I started fitting into size medium and small clothes from the department store, I started to feel like a success. I never imagined I would. I was so used to buying plus-sized clothes. I know my weight loss journey is not over, this is something I will be working on every day. I prevent relapse by knowing that if I have a bad day and go off my diet and/or exercise plan, it is ok and I can get right back on track. Once I get back on track I feel good about myself again. I also understand that my weight loss journey is not over. This is something I will be working on every day. Eating right and exercising IS my new life. I have a TON of confidence in myself. I feel like I can do anything now. I feel better, I am healthier, I am stronger. I even sleep better. I have more energy during the day. I actually enjoy shopping for clothes and I don’t hide from the camera any more. It’s fun to see people who haven’t seen me in a while – when I hear things like, “You look great.” it encourages me to keep going! I have maintained my current weight for about 4 months. I watch my weight very closely, and if I gain a few pounds I am quick to make changes to lose it quickly before it creeps back too much. This stops my yo-yo dieting cycle. 1) Never, ever give up! Keep trying and don’t get discouraged. If I can do it, anyone can. 2) Use the logging tools on Calorie Count. Track everything – food, water, exercise, and activity. I bet you will be surprised and discover some of your assumptions may not be what you think. 3) Eat the RIGHT kind of foods – avoid heavily-processed, high-sugar foods and watch those carbs. Try to stick to whole foods, but allow yourself to have a “treat” once in a while. Just don’t overdo it. 4) Take advantage of the amazing online support from other people on Calorie Count. You will be inspired and encouraged to keep going – no matter what life throws at you. 5) Get moving! You don’t have to be an Olympic athlete. Make exercise a part of your life. Walking is a great exercise anyone can do – just start. A great quote to remember is – “A journey of a thousand miles starts with one step.” Take that step and you’re on your way. 96 Pounds Lost: New Mom on a Mission!